*ONE* white man having the ability to trick and dominate a whole nation of people. have his way with them.. then eventually becoming the gatekeeper of jamaican music in the uk. to market the music to wider audience outside of the various west indian UK communities. seems as if rodigan had a bigger vision and also had a focused plan of action. lets assume coxsone and rodigan had the same vision and same hustle. rodigan wasnt the first to bust reggae music in the uk. he surely was the first to take the music to another level. much farther than just being played at local halls or neighborhood house parties. for reggae music to get to that bigger level it required someone like a rodigan.. a white person who could sell the music to the establishment and to the everyday white working class. bbc or any major media house and push the music..
never bubbled beyond those communities until a white person presented it to the rest of the nation .. i know none of that fits into the one-love, unity thing.. , but such is the harsh reality of the world we live. basing their career on interactions with you, then sure there are going to be some stories of monetary injustice. those stories may be true, some may not be true. but surely rodigan isnt the only one who has handed over a lighter than expected envelope. so big up coxsone and rodigan. your cant satisfy everyone..
Edited 4 time(s). Last edit at 04/09/2017 01:21AM by bigvein. i too am a massive rodigan fan, please take time out to watch the video, i honestly dont know what to make of it ? it could, but i doubt it.. i see many here as rodgian fans or rather respectors of his works. any opinion that is 'critical' of coxsone could be seen as 'racist'.. no one is going to open themselves up to being labeled as such. Why does he feel the need to put this 17 minute video out there? Good for Reggae music in general over the years. White, Black and Brown people are responsible for the rise and marketing of Reggae Music. This is a fact. No one race is responsible for the current or former state of Reggae Music. the Coxson Rodigan Debate! some are upset that he used the term "white Boy" those that are upset are not accustomed to the reality of his time and efforts in the name of Jamaicans in the so called mother land called not so welcoming Great Britain, he has been called far worse names because of his colour by the white natives so if he says white boy give the man a break he deserves it. below you can read my original reaction to this debate. you think any of the artists making any form of music 30 years down the line suffered like the "originators" you would be sadly mistaken..
We all know that a lie travels half way around the world before the truth has got its boots on and one of Dennis Brown's best songs was… "What About The Half" (that's never been told)... So with that in mind I have this to say in response to Lloyd Coxsone's video. Traditional Reggae music has always stood up against injustice, against the downtrodden, against tyranny. There's nothing worse than injustice, nothing worse than being falsely accused of doing or saying something that you never said or did. I will not enter into a long diatribe about Lloyd Coxsone's video rant against me. Suffice to say that it was vicious, vindictive and worst of all… it was laced with untruths and falsehoods. I'm not going through them all but I will point to just one of them. The Godfather lie. The real bone of contention seems to revolve around me apparently saying that l am The Godfather of Reggae. I challenge Lloyd Coxsone to prove that I ever said that. Prove it by showing the video footage, prove it by showing the press interview when I said that... prove it. I am powerless over what a radio or television presenter or journalist says about me, whether it's a term of praise or an expression of disapproval. But I am NOT powerless over my own mouth and what comes out of it. I have never said that I am The Godfather of Reggae neither have I said that I'm the King of Reggae neither have I ever claimed to have 'bust a reggae artist' because I would never be so arrogant and presumptuous. I have no further comment on this matter. AND... crickets.... one love Mr Rodigan. Late 1970's - a set of feisty Rasta youth corner Yabby You in the ghetto & confront him with implied threats of violence: "Yabby You wha da mon agwan wit? Pure disrespect of His Imperial Majesty ... Ya nah see-it ... Bob Marley fill football stadium roun dis wurld ... reggae gone clear ... Jamaica gone clear ... Wi going pon top now." True words Yabby spoke to the yutes. Reggae & Jamaica nah gone clear. Today Jamaica has the 4th highest murder rate on the planet (amongst non-declared war zones) & on an island of only 2 3/4 million population there are 5000 missing children. who exactly are you looking to respond ? compared to comments you see on the various you tube videos. have you checked what muta said in a recent 'stepping razor' episode ? people, foreigners always claim nothing to give..
to that, i cant speak..
but what i can speak on, like you have pointed out... it takes many of all stripes to make the reggae BUSINESS..
the music by itself, should always be attributed to mainly jamaican blacks. but if we are talking about the reggae BUSINESS.. then many nations had a significant role to play. if you think about the BUSINESS, it takes what ? buy in from these select few, reggae does not become a business..
the music would be confined to jamaica, with some guys strumming on make-shift instruments..
Edited 2 time(s). Last edit at 04/14/2017 05:04PM by bigvein. Edited 1 time(s). Last edit at 04/14/2017 06:41PM by bigvein. Edited 1 time(s). Last edit at 04/15/2017 05:51PM by Peacemakeya. Rodigan has the advantage of playing on BBC. And would a Jamaican ex-pat in the U.K. get the same opportunity as an Englishman for a prime radio spot for reggae, especially in the 1980s? Doubtful. Does Rodigan's success exist largely from explaining reggae music to white people? Significantly. Do black people tend to give more credit to others for promoting their culture than their own? Not my argument to make, but I hear it often. That's not to take away from Rodigan's talents or his knowledge, but I can understand why true UK reggae pioneers going back to the 1960s and 70s feel slighted in favor of the white guy with the privileged platform who gets more credit. in the article you reference is a picture showing where the 'godfather' statement came from. 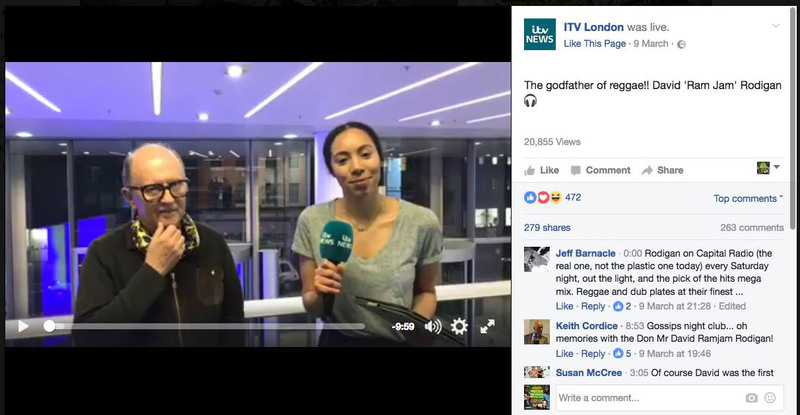 rodigan never said 'godfather'.... it was a headline written by the ITV media group..
maybe thats why coxsone didnt explore any business dealings beyond his local cross streets..
the guy clearly couldnt read or is just oblivious to context..
Haven't seen the vid yet but one thing is a fact. If it was not for Rodigan, I would not be the reggae freak I am today. I would not be spending all my money on iTunes, supporting reggae artists when they are touring locally, or spending tens of thousands a year on festivals, etc.